If you are just after our personal recommendation for the best dual camera baby monitor, we like the Infant Optics DXR-8. Every parent enjoys some peace and quiet, and many of us have those days where we just cannot wait for nap time. But, being a parent also means constantly worrying for your child’s safety, especially in the earlier stages when you are still getting used to having a baby in your home and have not learned her habits yet. Baby monitors are lifesavers when it comes to giving you peace of mind. They give you the freedom to wander a bit further from the bedroom door knowing that you will hear your baby when they need you. But, with so many options, how do you know which baby monitor is best, and is it really worth it to spend the extra money to go with video? After relying on audio-only baby monitors for several years, many parents are now making the switch to video. The question is: is it merely just following a trend, sticking with the latest technology, or are there actual benefits from using a video monitor? Audio gives you some peace of mind, giving you the ability to hear your baby’s breathing while she sleeps or those first peeps of her waking up. But that is the thing: you only get audio. There have been many times where I have gone in to get my baby after hearing her waking noises, only to find that she was not fully awake of trying to fall back asleep, and I sabotaged her efforts. Having video allows you to actually see what your baby is doing. There may be many times that she sounds awake, whether she has already been asleep or is trying to put herself to sleep, but she is really just readjusting or winding down. Utilizing video can allow you to keep an eye on your baby, knowing when she is actually awake or falling asleep, without ruining her efforts by you coming into the room. When babies and toddlers are awake, they tend to make a lot of noise, so when they get quiet, you know there is a good chance they have gotten into something they should not. There have been many times that my daughter has been in the other room and very quiet, and I turn the corner to find that she has grabbed my empty coffee mug or has found my phone or glasses lying around. If you are a parent that puts your toddler in her room for a nap while she is still awake, or you have a play room where your child spends some time by herself, video also allows you to keep an eye on what she is doing. Especially if she gets very quiet – in which case audio monitors do you no good. The Infant Optics DXR-8 is a high quality video monitoring system with stacks of features! Starting with the camera, there is an interchangeable optical zoom lens, providing 1x zoom on your angel’s sleeping face without distorting the quality. Now, the inability to zoom via the parent unit may not be the most ideal, but you will have a clearer picture with the zoom lens. There are tilt and pan controls on the parent unit, however. You get just the right angle with 270° pan and 120° tilt. This monitor set only comes with one camera, but the system is expandable up to 4. There is no split screen mode to view multiple cameras at once, but there is a scan mode which will automatically cycle through camera views. The monitoring unit has a 3.5” display with a retractable antenna and kickstand to make it both easy to carry and keep nearby where it is easy to see. It also has up to a 700-foot range, which allows you free roam of nearly your entire house. There are two power saving modes: sound-activated and audio only. The monitor itself has a base battery life of about 6 hours, but with one of these power saving modes, you can nearly double the battery life. Some other additional features: temperature readings on the parent unit, sound-activated LED lights, and alerts for low battery and out of range. 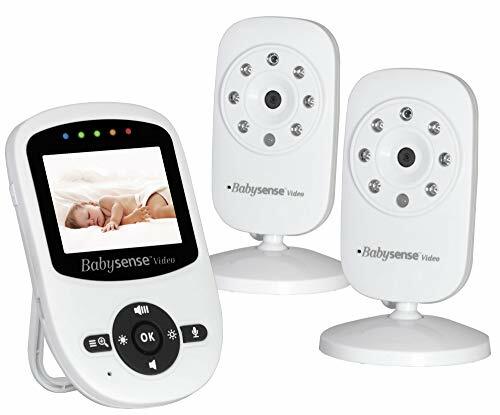 For a relatively unknown and inexpensive brand, the Babysense video monitor has some surprisingly good reviews and features. 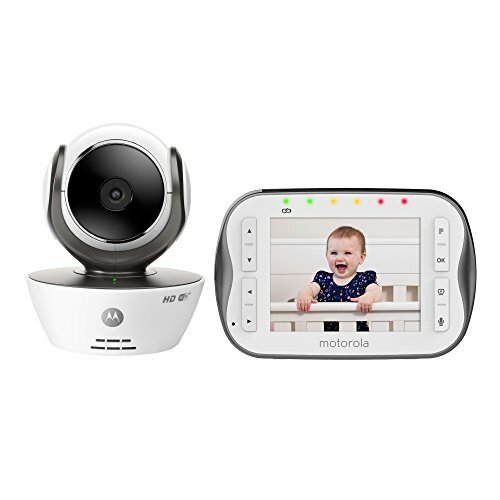 This monitor kit comes with 2 cameras and expands up to 4, which can be viewed on the parent monitor unit via split screen or scan cycle. The range on this monitor is very good (up to 900 feet unobstructed) and has about a 7-hour battery life. You can extend this a bit further with eco-mode, which changes the monitor to sound-activated display. Timer setting for feedings, diaper changes, etc. Despite its excellent features, there are a couple of drawbacks. The display on the parent unit is very small – only 2.5”. This can make it very difficult to get a clear picture, especially when you are viewing multiple cameras via split screen. In addition, the camera angles cannot be adjusted via the parent unit. You need to manually angle them just right before you are ready to use them for the first time. 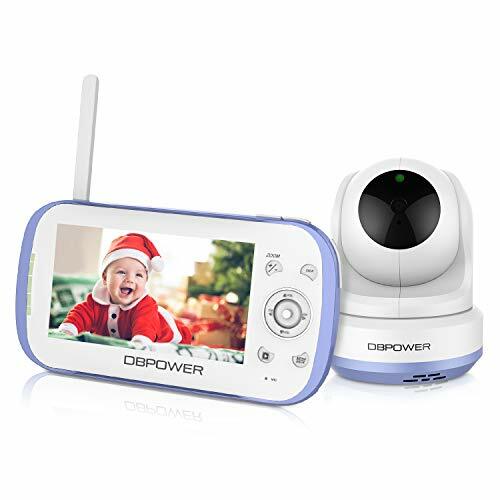 If you are looking for a monitor that allows you to record and playback video of your little one, the DBPower digital video monitor may be the one for you. This set only comes with 1 camera but the system is expandable up to 4. These can be viewed via auto-scan or split screen on a large 4.3” display. The only downside to split screen is that there is only an option to view 4 screens no matter how many cameras you have installed. The cameras can be fully controlled – 100° tilt, 270° pan, and digital zoom – from the parent unit, which has up to an astounding 1000-foot range up to 9 hours of battery life. Beware, there are no audio-only options for saving battery life. There is an option on the parent unit to install an SD card (up to 32GB) for video recording. This can be set to start automatically if you will be leaving your little one with a babysitter, or you can manually start recording if you want to capture something memorable. Sometimes it’s nice to have the option to check in on your nanny or baby while you are at work, and the Motorola WiFi MBP843-CONNECT allows just that. This set is a bit pricey, but you do get two cameras – able to be fully controlled and adjusted remotely – and WiFi capability to connect to your smartphone or computer via Hubble app. The system is expandable up to 4 cameras with an auto-scan option (no split screen available). The parent unit itself is subpar with only a 3.5” display and up to 5 hours of battery life, but if you are connected by another device, you have more flexibility and control over those factors. One really nice thing about this monitor kit is that everything you can do from the included parent unit – camera control, two-way talk, room temperature display, lullaby control, and camera auto-scan – can also be done via smartphone. 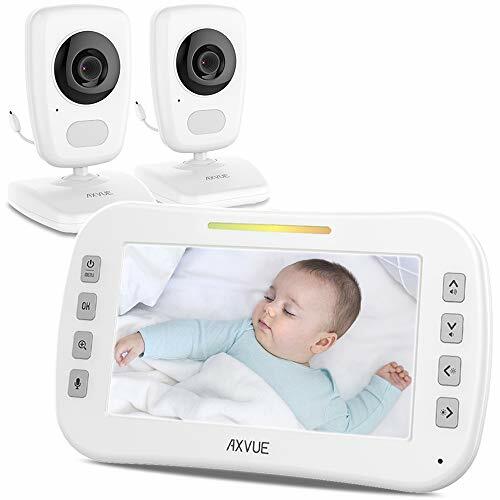 The AXVUE E632 video monitor is a great dual camera monitoring system for the family on a tight budget. This kit comes with 2 cameras but is expandable up to 4 total. There is no split screen option but you can cycle through the camera views via auto-scan on the large 5.0” display. The parent unit has up to an 800-foot range and up to 8 hours of battery life. You can set the monitor to VOX (video off, activated by sound) mode to save a bit more battery if you are going cordless. Unfortunately, the cameras cannot be adjusted remotely (you do still have digital zoom). However, the camera angle is fully adjustable in all directions, pivoting forward and back as well as side to side in addition to the regular pan option. From the parent unit, you can also monitor the room temperature and noise level (via LED lights). You also have the option for two-way talk to let your baby hear your voice without having to disrupt them by entering the room. Keep in mind that you get what you pay for, especially when the manufacturer is not well-known. The video quality is not the best and may not be suitable if you want a crystal clear view of your sleeping angel. So, now that we have looked at some of the benefits of having video monitors over audio-only, you may be asking another question: why would I look for monitors with two cameras, rather than just getting a set with one? Dual cameras can come in handy a few ways. First, if you have multiple children who sleep in separate rooms, you can have a camera in each room to keep an on each of them. This especially comes in handy if you have a monitor set that allows split screen viewing, so you can view both rooms at once. Second, as we mentioned the designated playroom before, you can have a camera installed in the sleeping room and play area so that you do not have to deal with the hassle of switching the camera between rooms and you can allow your child some independent play time. Finally, depending on the size or layout of your child’s bedroom, you may want two cameras for different angles. One can be focused directly on the crib or bed, so that you can have a close look at her while she is sleeping, and the other can give you a wider view of the room to keep an eye on play time or babysitters. With your baby monitor, you want portability. Of course, you will not be wandering far, leaving your baby at home while you run to the grocery store, but also do not want to be confined to the room next door in order to keep the signal strong between the monitors. Finding a monitor with a long range will allow you to free range of the house so you can get things done or simply relax on the couch in front of the TV. Some monitors even have a range long enough that you can check the mail or enjoy some sunshine on the porch. With some newer digital monitors, you are also given the option of viewing your baby on your phone via mobile app. This option is great for those times that you leave your baby with a sitter to enjoy a date night or just some quiet time out of the house. For years, baby monitors have operated on radio waves, making them, essentially, expensive walkie-talkies. Due to their radio frequency, baby monitors have been known to pick up stray signals, either from other walkie-talkies or from truckers. Opting for a digital monitor allow for a safer frequency with no interference. You will not have to fear a stranger hearing you and your baby in your home or your baby being woken by a random voice over the monitor. Bedtime is primarily when you want to be using your baby monitor. You want to make sure your baby is resting well, comfortable and breathing. But what good is a video baby monitor if you cannot see your baby in the dark? Many video baby monitors have integrated night vision which allows you to see your baby in the dark. In addition to having a night vision feature, it is also preferable to find a monitor with automatic night vision, so that you do not forget to turn on that feature at night. There are few things worse than putting your baby down for a nap, with grand plans to spend some time outside or get some chores done around the house, and having your monitor low on battery or die with no warning. Long battery life will allow you to remain mobile with your monitor rather being tied to an electrical outlet to keep the connection going. Having a battery indicator is also a good feature, as it will alert you when the battery is low so you can charge it before you need it. Some monitors even have an additional battery feature which will save battery power while it is in use. When running on battery, rather than plugged in, the display will only activate when there is movement or when you prompt it, keeping the screen off when it is not needed and saving your battery. Putting babies down to sleep can be a difficult task. After fighting for what feels like forever, the last thing you want is for them to wake up, due to sound or being uncomfortable, and have to start the process all over again. But you also do not want to have to sit in silence for the 2 hours your baby is napping. Newer models of baby monitors sometimes include features that can indicate the temperature of the baby’s room and the amount of sound that she can hear from her sleeping spot. These features are very handy for making sure you can keep your baby happy and asleep while you are still able to enjoy yourself and get things done around the house that may create some noise. Having two cameras, either in the same room or in separate rooms, means that you can adjust the angle to be able to see what you need to. But sometimes, one angle is not enough, especially if the camera is in a playroom where your baby is on the move. 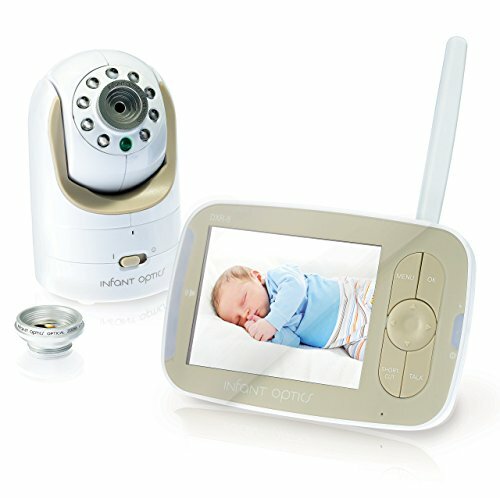 A great feature to look for in your video baby monitor purchase is a camera that can be controlled by the parent unit. This will allow you to pan the room and see from all angles. Cameras that have this feature can also, oftentimes, zoom in, which will come in handy when you want to see a close-up of your baby to check her breathing or see if her eyes are still open. Digital baby monitors can be vulnerable to hackers. If someone were to tap into the video signal they will have visibility on a large portion of your house. Not to mention who is in there! The thought of this is unsettling at best, and dangerous at worst. Make sure you check out our full guide on how to prevent your monitor from being hacked so you know what to look out for. If we had to pick one video monitoring system overall, we would recommend the Infant Optics DXR-8. We have to agree with the thousands of positive reviews regarding its function and features. Even though this kit only comes with one camera, extras are easy to locate and purchase separately to expand your monitor system to its full potential. We also like that the camera’s tilt and pan options are available remotely and the extra lens provides a clearer picture than digital zoom. It may not come with all the bells and whistles you may find in other systems, but you get what’s important: temperature gauges, talk-back, long battery life, wide range, and LED sound indicating lights. What do you think? Is there a dual camera monitoring system that you like? Let us know! List of nursery theme ideas! PrevPreviousHow Much Milk Do Breastfed Babies Eat Each Day?